A thumb injury can be devastating given how often we use our hands in everyday life. Whether we’re pushing the snooze button on our morning alarm or brushing our teeth before heading to bed, we’re using our hands almost every minute of the day. When you injure your thumb or any of your other fingers, performing those routine tasks can become extremely difficult. Fortunately, the team of orthopedic experts at Tahoe Fracture & Orthopedic Medical Clinic in Carson City, Nevada, has the training and experience needed to treat your thumb injury. Fractures — Thumb fractures are particularly common among athletes, who may sustain the injury when catching a ball or tackling another player. Although this type of thumb injury can often be treated with a cast or splint, it may require surgery, depending on the location and severity of the fracture. If you suspect that you may have fractured your thumb, you should seek treatment as soon as possible, as thumb fractures may increase your risk of developing arthritis in the future. Basilar joint arthritis — Basilar joint arthritis affects the basal joint, which is located at the base of the thumb. Because the basal joint is responsible for rotating, extending, and flexing the thumb, this thumb injury can make it difficult to pinch or grip items. Although we generally recommend that patients attempt to conservatively treat their symptoms before undergoing surgery, we can also treat basilar joint arthritis with a total joint reconstruction or other procedure, if needed. Trigger finger — Trigger finger can affect any of the digits, including the thumb. This condition makes it difficult to straighten a finger or thumb, making it appear to lock in place. Trigger finger can get worse as time passes, meaning that it’s imperative to seek treatment as soon as possible. 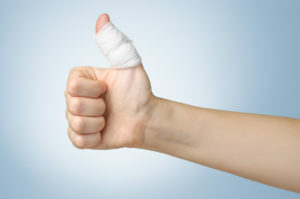 If you’ve sustained a thumb injury, please contact Tahoe Fracture & Orthopedic Medical Clinic to schedule an appointment at our Carson City, NV, location. We are a full-service clinic — our team includes various physicians, surgeons, physical and occupational therapists, physician assistants, and nurse practitioners — so you can rest assured that you’ll be receiving seamless care for your thumb injury, start to finish.